QUEEN OF SHADOWS was just utter, utter perfection for me. I was a bit of a late-comer to the Sarah J. Maas fandom having just started the Throne of Glass series last year (I binge read the first three books right as HEIR OF FIRE came out) and I absolutely fell in love. Even though it’s been a year since I’ve been immersed in this world, picking up QUEEN OF SHADOWS just felt so comfortable and I easily fell back into all of the magic that this series has to offer. It’s hard to review the 4th book in a major series without giving plot points away so I’m going to stay off of plot (for the most part) and try to talk about more about specific elements of the book that I enjoyed as well as how the book seems to be standing up to criticisms (yes, people have them and I don’t understand them). One thing that I’m always incredibly impressed with is Sarah’s ability to really make this series one long story. Even though it’s broken up into six books, each novel relates back to another in the series and I’m always so impressed with not only how they tie in to one another but also how they are constantly connected right from the beginning and we only get to find out those connections as we dive further into the series. I also really just love how this book feels like “coming home”. Reading QUEEN OF SHADOWS gave me that feeling of “Yes, I love this world. I know this world. This is where my heart belongs” and I feel that each time I read the next book in the series. Sarah J. Maas does a fantastic job of making these books come alive in every possible way. The settings and world building are incredible and I really do feel like I’m experiencing the novel as I’m reading it — I’m fully immersed. The characters and their personalities really just come to life and I feel like I’ve really come to know these people and places. I’m constantly impressed with the character growth throughout this series as well. If you look at Celaena/Aelin from THE ASSASSIN’S BLADE or THRONE OF GLASS and Aelin in QUEEN OF SHADOWS, she’s a totally different person and I love seeing how much she’s grown throughout the course of these books. She went from arrogant teenager into blossoming queen and it’s been amazing to witness that slow and subtle transition. She’s really grown so much and she’s starting to own this queen-business and I am 100% behind her! 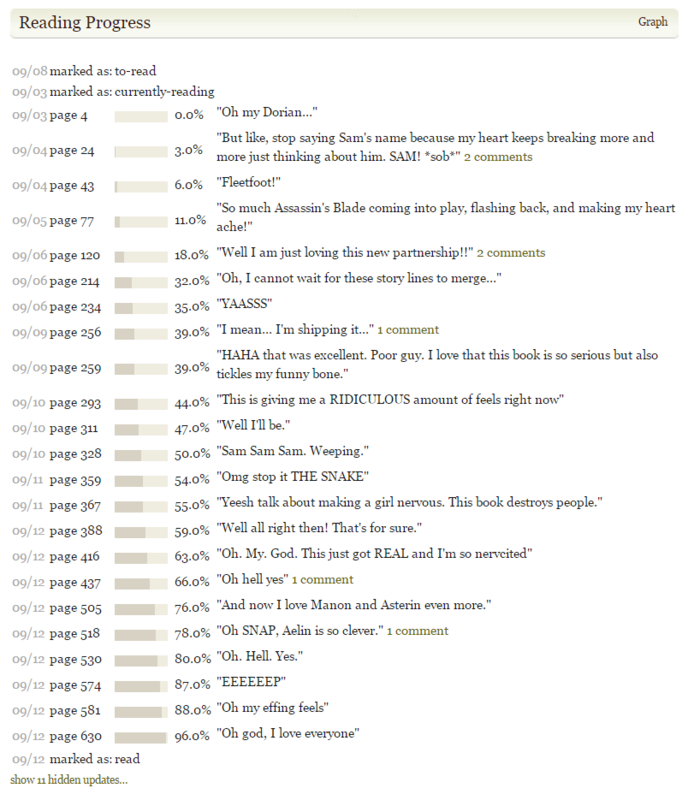 I was actually surprised that character growth seemed to be a negative thing in some reviews… I did a rather silly thing and read some one and two star reviews because I couldn’t fathom why people were so put off by the this book when I felt so in love with it and some people said that Aelin was totally different and where is old Celaena. But… YES! Of course she’s different! If the whole series had been about arrogant and cocky Celaena, I wouldn’t have liked it. There would have been no character growth at all. She’s been growing and changing this whole time and I think most of that happened in HEIR OF FIRE so I was kind of shocked that this — what I felt was slight — change in demeanor was so surprising and so many people were taken aback. I think Aelin has been growing up this whole series and I’ve been so impressed with the changes she’s made! I think she still has the same personality but because of her goals, because of what she’s been through, and because of what she’s learned, she’s changing from a girl into a young woman and handling herself differently. You can’t be a spoiled and arrogant queen. The way the romantic feelings have evolved and changed have also been handled extremely well. Personally, I was never a Chaol/Celaena shipper. I would have been happy if they ended up together (hey, they still might — series isn’t over yet) but I was never fully invested in it for some reason. Things really start to change in QUEEN OF SHADOWS and as these characters grow, they start to explore their true romantic feelings and pulls even more and in some cases, they’re not quite what they used to be. It sort of felt like growing out of your old high school crush or boyfriend — what you had in common when you were younger may no longer be applicable and as people grow, they tend to change and refocus their goals, what’s important in life, and who a perfect match for them might be. I felt like that’s what happened with Aelin and Chaol. Maybe Celaena and Chaol would have worked well together but I don’t think Aelin and Chaol are meant to be. They’ve both been through a lot throughout the course of this series and their end goal is still the same but their paths may not be quite identical anymore. I think both characters started to realize this, especially in QUEEN OF SHADOWS. Of course, the story itself was just amazing. QUEEN OF SHADOWS was a hefty book at over 650 pages and there was so much that happened… and none of it ever felt unnecessary. I never tired while reading QUEEN OF SHADOWS and wished I could stay within these pages long after the book ended. I was constantly captivated and didn’t want to put the book down! Sarah J. Maas is an expert story teller and I could get lost in the pages of her books forever. I’m a huge fan of this series and Sarah’s stories and I will be forever anticipating new works from her! This series is incredibly well-done and I can’t wait to see where else this plot takes us. Aelin // Character Obsessions: Defeat of the Valg, protecting the kingdom. I am so impressed with how much Aelin has grown throughout this series. I’ve loved witnessing her changes and how she’s been handling things in the past couple books. She’s still the same badass and has that same personality/attitude, but her focus has changed so much more now that she’s owned being the Queen of Terrasen. Lysandra // Character Obsessions: Evangeline, debts, revenge. There is SO much of THE ASSASSIN’S BLADE that we see coming back in QUEEN OF SHADOWS and guess what! Lysandra is back! I loved seeing the role she ended up playing in this book and I LOVE that it ties all the back to THE ASSASSIN’S BLADE. Kept Me Hooked On: Epic epic fantasy. This is some EPIC epic fantasy. I love how books and series like this just fully pull me in and make me feel like I’m a part of the story. Left Me Wanting More: Manon/Aelin encounters. I’m still enjoying the Blackbeak side of the story BUT I do wish there was a bit more connection to the main plot. I love Manon and I’ve been so happy to learn more about her but I can’t wait for this half of the book to tie in some more! This is easily one of my all-time favorite series. The books, the characters, the world-building, the writing — all have grown throughout the series and I just can’t get enough. This entry was posted in Books, Fantasy, Review, YA and tagged Books, Crown of Midnight, Fantasy, Heir of Fire, Queen of Shadows, Review, Sarah J. Mass, The Assassin's Blade, Throne of Glass, YA, Young Adult on October 6, 2015 by Brittany. Thanks for your review. I also don’t get the negativity some people have toward this book. Yes Celeaena/Aelin felt different but you’re right character growth. To be honest, I think the name change is what’s throwing everyone off more than her specifically. I thought this book was utter perfection. There were scenes where afterwards I just had to sit and reflect on its beauty, and perfection. I love how Sarah connects so many things and people. Great review! I totally agree with your review. I love seeing how Aelin has grown and is still growing. It probably has to do with the fact that I also read the first three books back to back and thus I loved the journey rather than being completely focussed on Celaena’s character. YES LYSANDRA. She is definitely one of my favourites in this book. Can’t wait for the next one!